Many of you have heard the word “futon”. Some of you have not. But, since I’m going to tell you about them anyway, that is irrelevant. As you can guess, “futon” is a word of Japanese origin. Thus, a futon is, first of all, a Japanese mattress. Not just any mattress made in Japan, mind you, but one that can be folded and stored away. Obviously, Japanese futon mattresses are some of the best ones. So what is a futon exactly? I’ve just said it, but I guess, it won’t hurt to repeat this again, with some details thrown in. 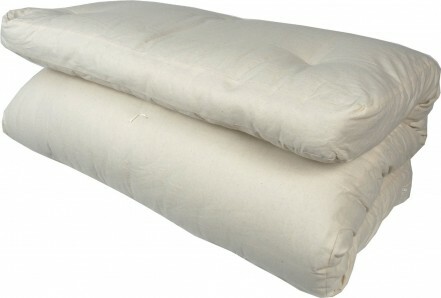 A futon is a mattress that is to be laid on the floor, a mattress that can be then folded and put away. It’s a Japanese mattress. You don’t put it on top of your bed. 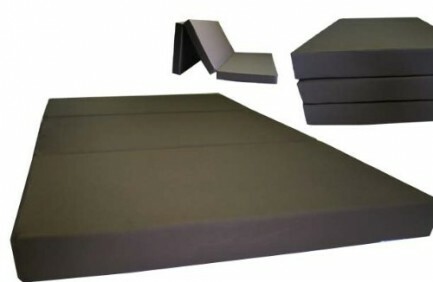 In that regard a futon is very like the best air mattresses, the difference is a futon is usually a permanent sleeping arrangement, although it can be taken with you when you travel, and it is not exactly vulnerable to pointy things. But that’s if we’re talking about Japanese futons. The West now has futons of its own. They are not exactly dissimilar to the Japanese ones, but they can still be considered different enough. A western futon is not exactly a mattress. Well, it is, but the thing is, it more about the frame. 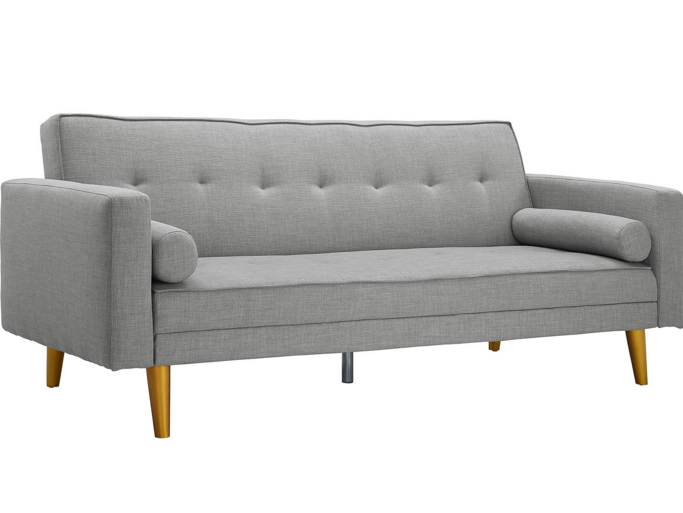 A Western futon is more like a collapsible coach, than a mattress. Since we’re talking about mattresses, we won’t be reviewing the Western types beyond this note. That shouldn’t be a problem since their supply is quite vast. That said, let us get back to Japanese futons. Why are futons so popular in Japan? But that might be a wrong question to ask. You should be asking “Why aren’t European beds that popular in Japan?” instead. Japan is a different country with a culture different to ours. They were almost always sleeping on the floor, and although European (and American) furniture is gaining popularity over there, many still prefer traditional furniture. Their tables are quite low, and the sit on the floor as well… Unless, of course, they don’t use the Western furniture. But are futons only popular in Japan? Nope. We, Westerners, actually came to embrace their culture just like they ours… well, some of us did, anyway, and, even then, only certain aspects of it. Futons being one of them. Besides, aside from being part of the Japanese culture, futons are darn useful and healthy. In general, they are a good choice regardless. What are the benefits of using a futon? The best a futon can offer is some free space. Futons are a permanent sleeping solution, unlike an airbed (although they do work as guest beds, understandably so, and as camping bedding as well), and they only take up some space when they are in use. Imagine what your room would be like if that huge bed of yours could be just folded and shoved into the cupboard? You would have a lot of space previously occupied by it. So, then, futons are darn economical when it comes to space. Aside from space, they also might be healthy. Note that I say “might” be, that really depends on your health conditions. But, generally, they are. They are not the same as bare floor, but they do have I as their base, instead of whatever frame most beds employ. Let us open our top with this classic futon from EMOOR. Their futons are lightweight. That’s quite an advantage, since futon mattresses are meant to be carried around, and a considerable weight would impede you. Well, that is not an issue for this mattress. The mattress is not too thick, about three inches, but it is not the thickness you should be considering. It is dense enough for you to have no worries about feeling the floor. Granted, it does mean it is a bit firm. If you don’t like that, then the mattress probably just isn’t for you. 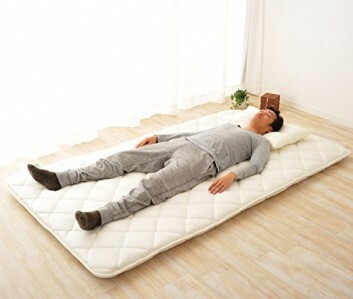 Otherwise, don’t hesitate and order this Japanese futon on Amazon.com right now! If you are not convinced yet, that is quite aright, we have four more mattresses to go anyway. But, as it stands, this mattress is still a good one, and, perhaps you want to reconsider. After all, it is not all that expensive. Not quite cheap, but not expensive either. Also, it is made in Japan. 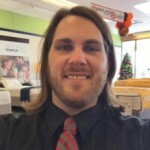 While I would usually recommend mattresses made in the United States as I should, we’re talking about Japanese mattresses, and authenticity matters too. Think about it, this company makes futon mattresses in Japan. They do know what a futon should be like. So, if it’s authenticity you’re after, you probably should get it. Another traditional Japanese mattress. Frankly, as far as futons go, all of them are traditional Japanese mattresses, with a few notable exceptions, unless we consider Western futons, either of which has little in common with a Japanese futon. But this mattress is a traditional Japanese futon, so let us not worry about superficial oddities for now. The number one distinction of a futon is its portability. Just how portable a futon is is another question. Unfortunately, this J-Life shikibuton is not the most portable among futons. Its weight is about thirty pounds, while the previous one is about 13 pounds heavy. So, yeah, while it is good for indoor, especially as a permanent sleeping arrangement, it is less suitable for travelling, because of its weight. The futon is Queen Size, and it is quite firm and thick. 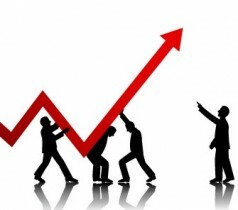 After all, the weight should be good for something, and that’s what it is good for. But, what’s more important, the futon is made of completely natural materials, it isn’t even bleached. The only issue with the naturalness is that is treated with boric acid for infallibility. It does make it less natural, unfortunately, but also enables it to meet federal flammability standards. The mattress may be a traditional Japanese one, but it is made in the United States. So, if you want to try out a traditional Japanese bed, but you don’t want it produced overseas, order this futon on Amazon.com right now. One of those… less traditional futons. One of the notable exceptions I’ve told you about. As you can see, it is a trifold mattress. And it’s made primarily of foam. The foam, while high density, is very lightweight, and it is very firm. The mattress is also very narrow and thin. If you put it on the naked floor, it is possible that you won’t have a very good night, but a carpet would do the trick. The futon is not that thin. But, while unwieldy, it’s easy enough to transport, due its weight and dimensions. Unfortunately, due to the same dimensions, it’s only wide enough to sleep stretched out. There is little space to roll about. Convinced yet? If not, read the 120+ reviews on this futon on Amazon.com. Another EMOOR mattress. Just like the other one, this is made in Japan. Comes with a comforter and a pillow, unlike the other one (which is a shikibuton without a kakebuton). Of course, it is authentic, and you don’t have to worry about it being a cheap knock-off. Regrettably, while not a knock-off, it is not also cheap. 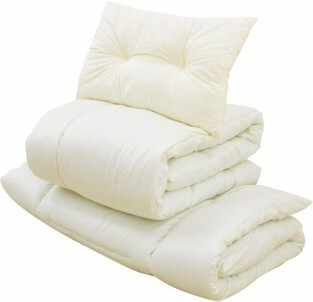 But the comforter and the pillow are both included, so, while not cheap, the set is worth its price. The futon is not made of 100% natural materials, after all, the stuffing is polyester, but that is hardly a problem since it is not prone to cause any kind of allergies. What may be a problem is the fact the futon is not suitable for sleeping on the floor as is. And that is something every futon is supposed to be good for. Either way, it does need another mattress under it for comfortable sleeping. 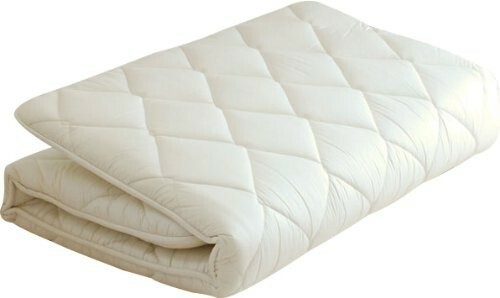 If you want a futon as a permanent sleeping arrangement and you already have a mattress to put under it, order this futon on Amazon.com right now. A mostly natural mattress, but aside from cotton it includes polyester and foam for additional comfort and support. Rather than foldable, the mattress is “rollable”. 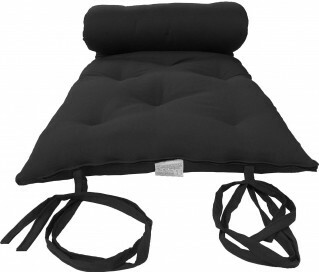 Not only that, the mattress comes with straps to prevent unrolling. The mattress is quite thick for additional comfort, but that makes it harder to roll. Thankfully, once you’ve done it several times, it would be easier to do since the material of the futon would be slightly shifted. The mattress is very lightweight, but also very large, which makes it unwieldy when rolled up. It is good for home, but no so much for travelling. The mattress, while very good in every way, is still a bit short. It’s no problem as long as you put the pillow on the floor, but not if you like to hold the pillow in your sleep. If that does not bother you, feel free to read the reviews on Amazon.com. While futons are Japanese mattresses, even then they are necessarily produced in Japan itself, even though many are. A futon produced in Japan might be authentic, but not necessarily so. The thing is, Japan of today is one the most developed countries in the world, so while they do know everything there is to know about the traditions of their own, and they are very likely to use modern materials as well. So the authentic part can be very relative. On the other hand, it is not unusual to find a futon produced in America. Oh yes, it would not be the same as a Japanese one, there would be no kanji and other cool things, but it most certainly would meet all the U.S. standards. And, what’s more important, the standard U.S. sizes would also match. First and the very important thing, is to know the thickness of the mattress. You only gave the thickness of one mattress. You are helpful on one mattress only, but not the others. Which mattress would work best in a tent for camping? Thanks for the question. While it may have skipped your attentionm, I already have a mini-article that, hopefully, addresses your issue. If it doesn’t, feel free to notify me and we’ll work something out. So basically, for a tent you would not recommend the futon? It might work. It is possible. But if, and only if, you already know what exactly you want. A futon would work technically, but they are meant for home use first. Using them outdoors is simply a possibility they are not designed for.